Meow Meow is the invention of Australian singer-actress Melissa Madden Gray. Being present for “An Audience With Meow Meow’’ — and I’d strongly recommend that you do so if you can — is like taking part in a high-wire act in which the performer has invited you up onto the wire with her. In other words, it’s a wobbly but strangely exhilarating experience in which the seeming inevitability of a fall keeps you on your toes, so to speak, even as you marvel at how well she manages to keep her balance. What Meow Meow delivers so wittily over 80 minutes at the Cutler Majestic Theatre is part cabaret act, part performance art, part sendup of the trappings of celebrity and the conventions of show business, and, perhaps most intriguing of all, part affirmation and heartfelt celebration of theater’s power to lodge itself in our souls. 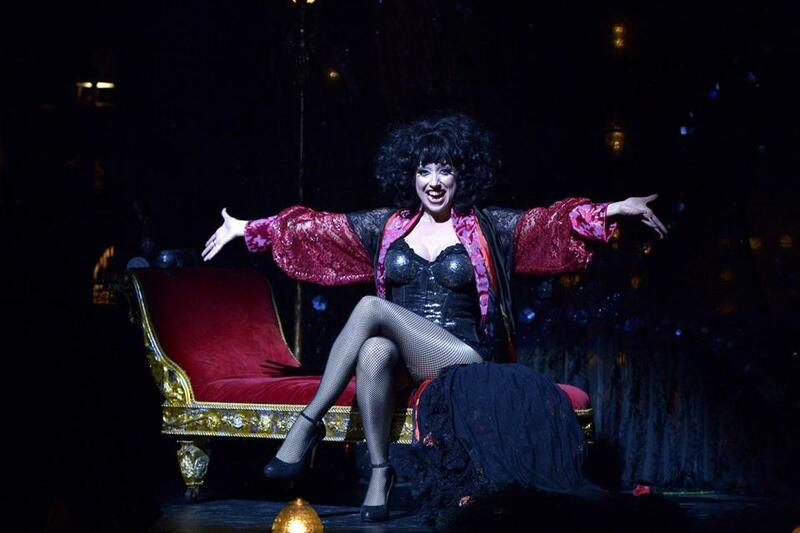 Something of the same happens at the Cutler Majestic, even though Meow Meow herself is an invention, the stage persona of Australian singer-actress Melissa Madden Gray. When Meow Meow refers to theater as a sacred space or declares that “A song should change the world’’ or delivers a salute to “all the dead rebellious women,’’ ranging from Isadora Duncan to Sally Rand, she appears to mean every word. Directed with brio by Leigh Silverman, “An Audience With Meow Meow’’ is shrewdly titled. Note that it’s not “An Evening With Meow Meow.’’ No, we’ve been granted an audience with Meow Meow, the way British prime ministers are granted an audience with Queen Elizabeth II (played by Helen Mirren on Broadway) in Peter Morgan’s “The Audience.’’ But the title also suggests that we in the audience need to be collaboratively with Meow Meow, not just in the bits requiring our participation but in the broader sense, as both show and performer perpetually seem to teeter on the edge of collapse. In reality, though, this star — and don’t you dare forget for a second that she is the star, even if you get coaxed onstage — is in complete control throughout. From her frazzled, pell-mell entrance to her crowd-surfing finale, Meow Meow subverts and toys with our expectations as she performs song-and-dance numbers and monologues that range from comic to mournful and back again. If she’s the cat, we’re the ball of yarn. Throughout the show, she keeps us guessing about what will come next. At one point, she lapses into German for a brief screed that invokes Mary Poppins and Kanye West. When she is asked whether she likes the Red Sox, she nods in seeming comprehension, then launches into a straight-faced disquisition about “The Red Shoes.’’ She entices a half-dozen audience members to join her in a cancan-style kick line. She satirizes the pseudo-confessional interviews and performances that have become part of the ritual of celebrity, and the phony intimacy celebs offer to their fans (“I do want you to know that each and every one of you is important to me’’). Certain influences can be discerned in her persona: Liza Minnelli’s Sally Bowles from “Cabaret,’’ certainly, along with a bit of Marlene Dietrich here and a bit of Gloria Swanson and other silent-screen divas there. Yet Meow Meow is not constrained by those influences, managing to come across as a fresh and singular invention — and one who’s not afraid to push her audience toward deeper reflection on mortality and immortality once she’s got them up on that high wire. “If I die tonight, will you remember me?” she asks. “If I don’t die tonight, will I remember you?’’ Amusing, yes, but with a melancholy undertow. It’s not the only time Meow Meow forces us to think about the void that’s left, for performers and for us, once the stage goes dark.